Tiny robots the size of an A4 sheet of paper could soon be disposing of suspicious vehicles and moving cars stuck in a tight spot. The machines, called Avert, can silently and gracefully lift and transport cars weighing up to two tons. The Autonomous Vehicle Emergency Recovery Tool (Avert) system is much smaller than a tow truck, but just as effective. 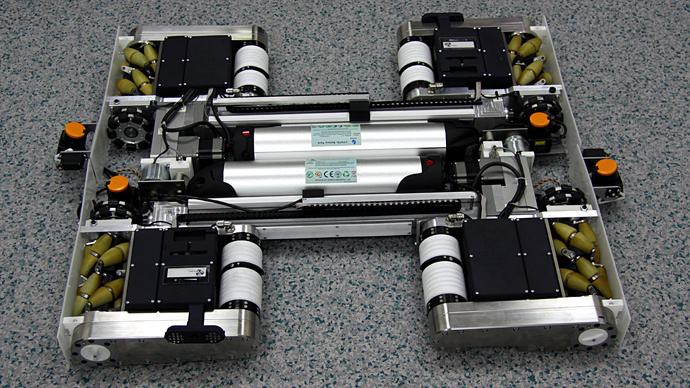 The system – the brainchild of a European consortium led by Democritus University in Greece – consists of eight flat robots working together. Each tire is gripped by two machines – one on each side. Once the tires are properly pinched, the robots lift the vehicle off the ground and carry it away. The Avert robots work by first surveying the area around them, planning their route, and getting around any obstacles hindering them. Once this is a done, bogies are released from a deployment unit and are tracked to the target vehicle. They then latch onto the wheels and lift the vehicle. The bogies come with onboard sensors, including a digital camera and two lasers. The robots are expected to be useful for law enforcement, allowing them to safely remove suspicious vehicles which may contain explosives. But Avert also has the capability to assist everyday automobile owners – by helping cars move within a parking lot without a driver, or moving vehicles stuck in a compact parking space. For example, the technology could remove the stress of parking in a crowded public garage. The system will be showcased at the International Conference on Robotics and Automation, taking place in Seattle next month. It has already been demonstrated to five European countries and businesses. The team behind the project hopes to begin commercial production by 2016.